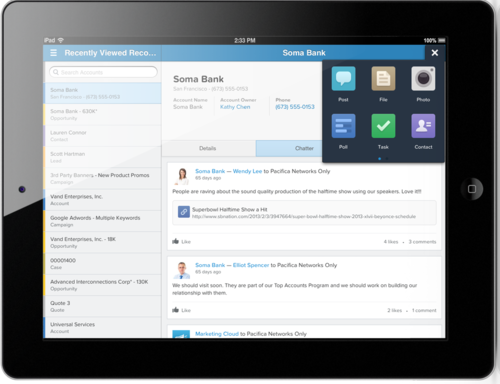 Salesforce.com is rolling out version four of its Chatter mobile application for social networking. Salesforce.com will soon roll out the fourth version of its mobile Chatter application, an update that gives users of the collaboration software more ways to view, retrieve and write back data to the core CRM (customer relationship management) system. One key new feature will give Chatter mobile users the ability to edit Salesforce.com records, such as customer-service cases or sales leads, from their devices, rather than only being able to read such records. In addition, Salesforce.com dashboards a user might look at in the main CRM application will now also be available in Chatter mobile. The third major feature, Custom Actions, allows administrators to create new workflows, such as for an inventory request or to approve a job candidate, and embed them in the Chatter mobile interface. Custom Actions are meant to help users take full advantage of "micro-moments" in their workday, spare snippets of time in which they can get real work done on the go, rather than having to wait until they're back at their desk, said Michael Peachey, senior director, solutions marketing. In a product demonstration, Peachey showed how an administrator would only need to take a handful of steps to pull together a Custom Action with Salesforce.com's tools. The Chatter mobile update will be generally available for iOS devices beginning July 29, with Android support planned for later this year, Peachey said. Salesforce.com customers get Chatter Mobile at no charge.